With Olympics and goaltenders on the docket, seems like a good day to stop in with Dr. Joe Sullivan, pictured here amid Swiss mountains in 1928. That year, when the University of Toronto’s Varsity Graduates bore the maple leaf at the second Winter Olympics in St. Moritz, Switzerland, Sullivan was the main man guarding the goal, with Norbert (a.k.a. Stuffy) Mueller backing him up. The Canadians rode a bye directly to medal round, which meant they ended up playing just three games. Spoiler alert: they won the gold. 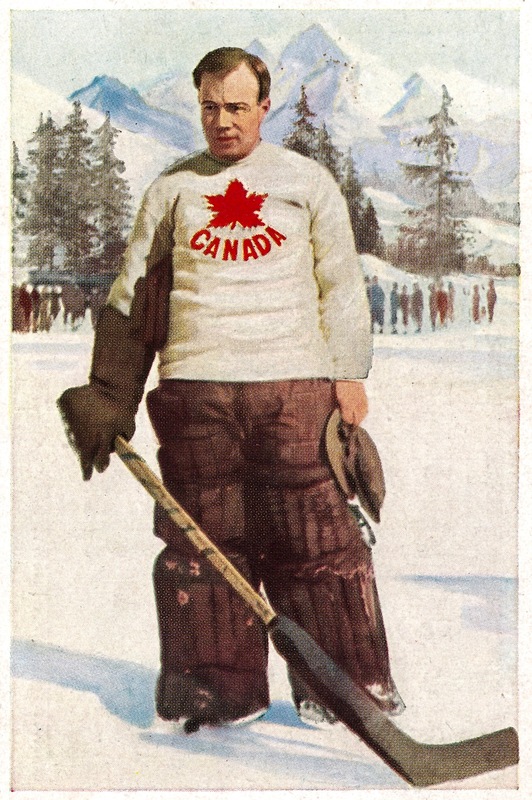 This wasn’t, let us say, a taxing tournament for the Canadians: on three successive days, they smoked Sweden 11-0; battered Great Britain 14-0; and stampeded Switzerland 13-0. Sullivan was on duty first and last, with Mueller stuffing in for the British game. Sullivan, 27 at the time of this triumphant shutout streak, is an interesting case. He’d graduated from the U of T’s Faculty of Medicine in 1926. Post-Olympics, there was mention that he’d be turning pro, joining the NHL’s Montreal Maroons, but while his Grad teammate Dave Trottier did just that, Dr. Sullivan signed up instead for a career in ears, noses, and throats: he opened his private Toronto otolaryngology practice in 1930. He served in the RCAF during Second World War and, in 1957, Prime Minister John Diefenbaker (who was one of his patients) appointed him to the Senate. He died in 1988 at the age of 86. The appearance of Mueller and myself caused an outburst of laughter and some applause for I suppose the formidable array of pads and body protection would seem strange to the people of Antwerp. Some people applauded our garb, evidently to counteract the effect of the laughter from the less thoughtful. ← falling through the ice: yow! crash! (crack, crackle) help! holy smoke!